The endocrine organs are ductless glands that release their secretory products (hormones) directly into the blood stream. 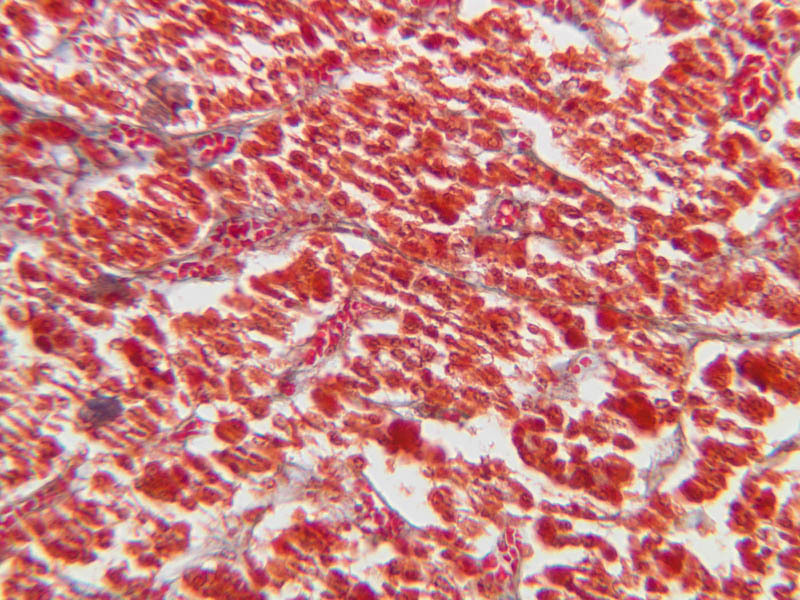 In keeping with their secretory mode, endocrine organs have exceptionally rich vascular beds. 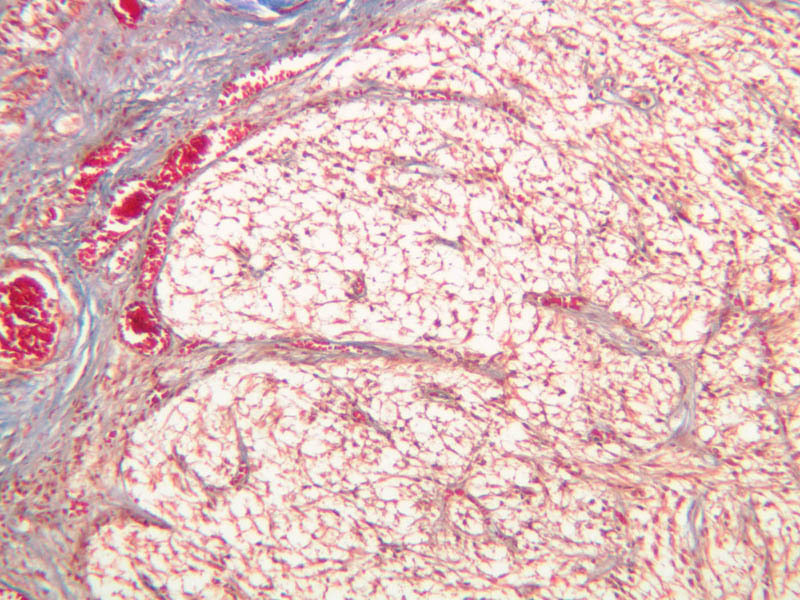 Typically, capillaries in endocrine organs are of larger diameter than those in most parts of the body; moreover, their endothelial linings are often fenestrated--i.e., there are "windows" through which fairly large molecules can pass. 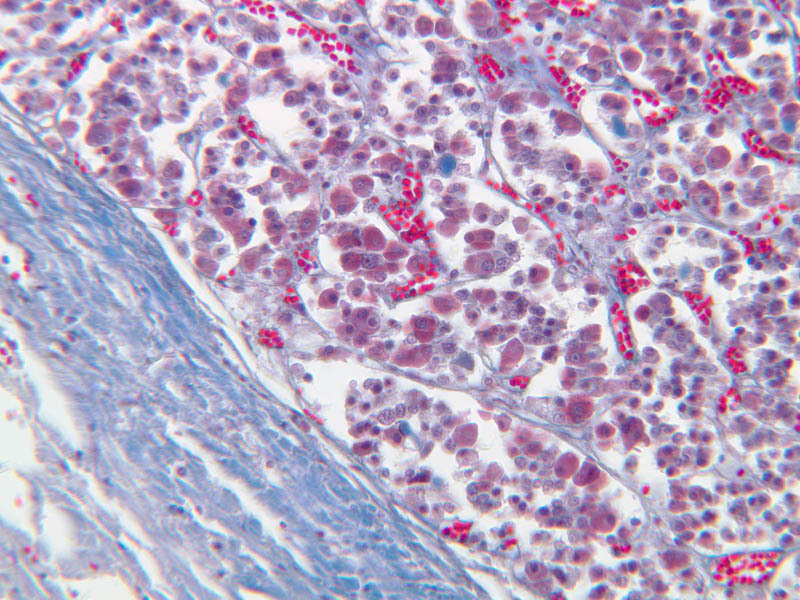 Also, in spite of having origins from diverse kinds of tissues, almost all endocrine glands are structurally epithelioid in appearance--i.e., they are composed of sheets, tubes, columns, or clusters of closely apposed cells. 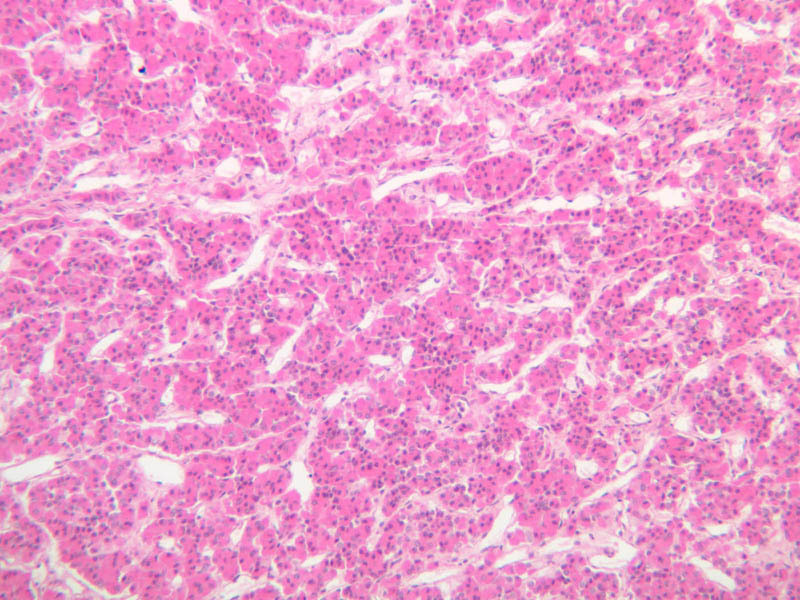 A less universal feature of endocrine cells is a content of granules suggestive of a secretory function. 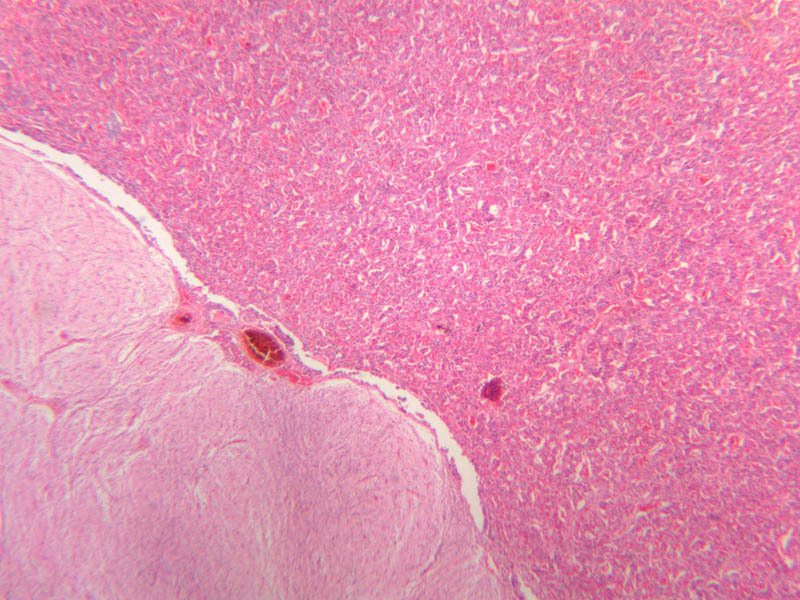 The adenohypophysis arises from oral ectoderm and forms the largest subdivision of the pituitary gland. 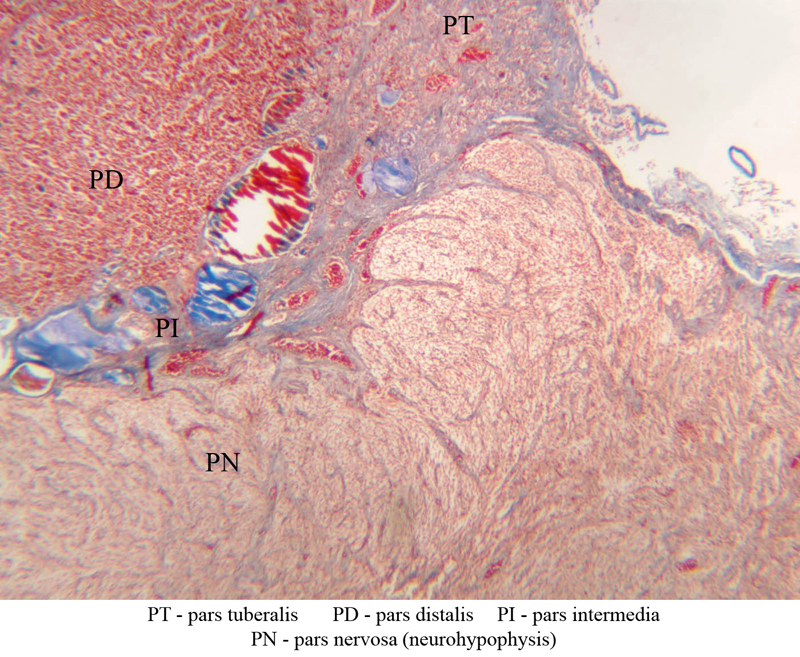 It consists of three regions: (1) pars tuberalis, which wraps around the pituitary stalk; (2) pars distalis, which makes up most of the anterior portion of the adenohypophysis; (3) pars intermedia, which lies between the pars distalis and the pars nervosa of the neurohypophysis and is characterized by the presence of colloid-filled cysts. 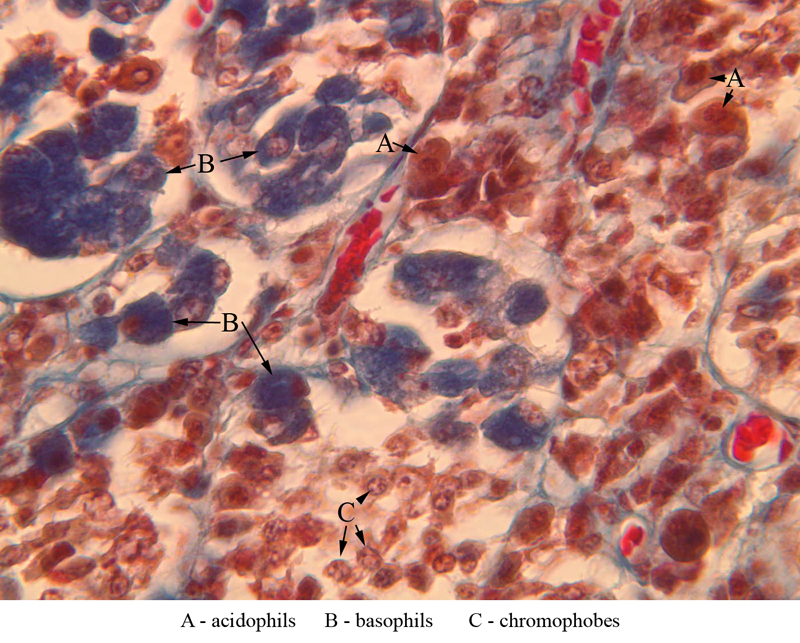 In H&E-stained sections, the adenohypophysis is darker than the neurohypophysis (B-63, H&E [2.5x, 10x-labeled, 20x]; B-64, aldehyde fuchsin [2.5x, 10x, 20x, 40x]; B-65, trichrome [2.5x]). The neurohypophysis arises as an outpocketing of neuroectoderm from the floor of a portion of the brain called diencephalon. 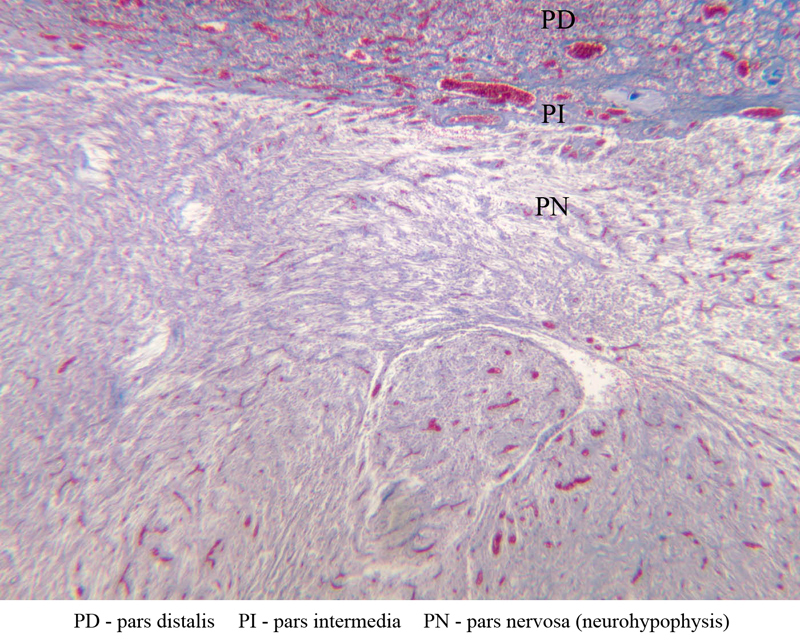 It is divisible into the pars nervosa, which forms the posterior portion of the main mass of the pituitary, and the infundibulum, or pituitary stalk. 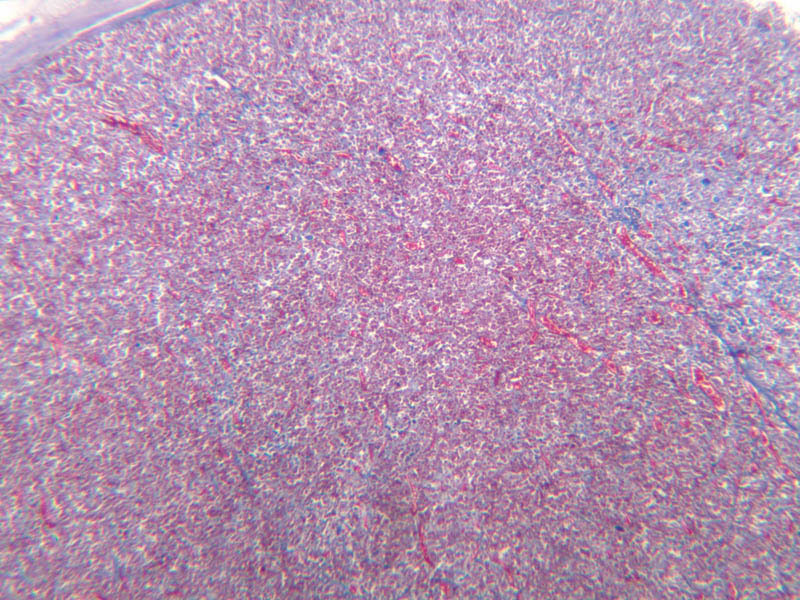 In H&E-stained sections, the neurohypophysis is distinctly eosinophilic. 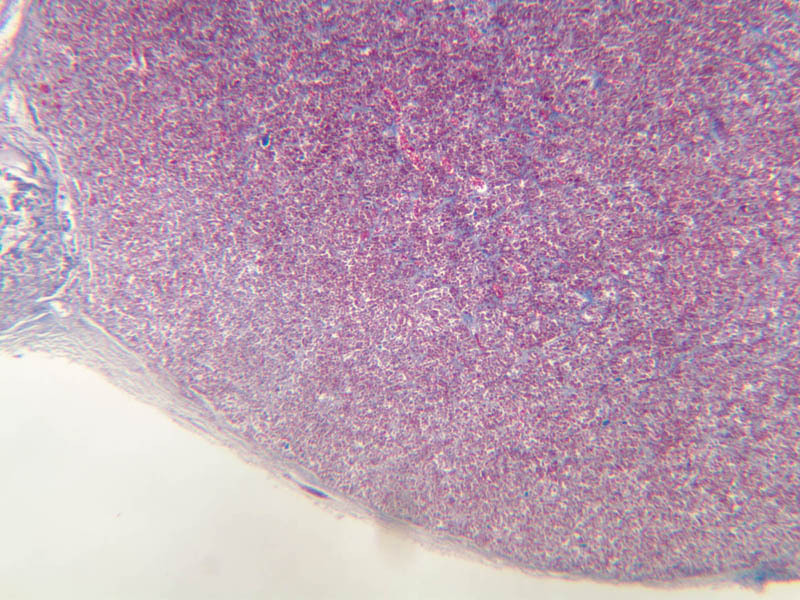 The adenohypophysis (anterior pituitary) has three different types of secretory cells, which are best visualized in the trichrome-stained preparation on slide B-65: (1) acidophils have a reddish staining cytoplasm, owing to the presence of secretory granules. 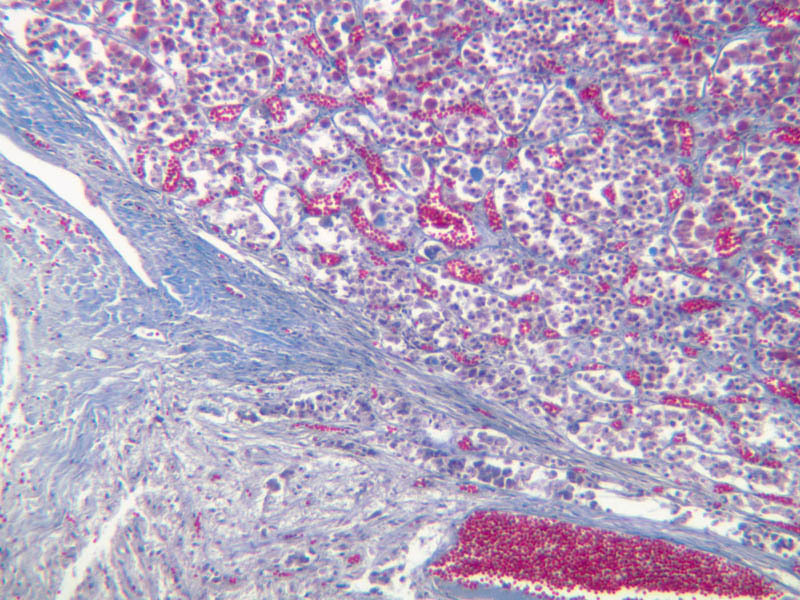 These cells secrete growth hormone (GH) and prolactin (PRL); (2) basophils are slightly larger cells with bluish staining granules present in the cytoplasm. 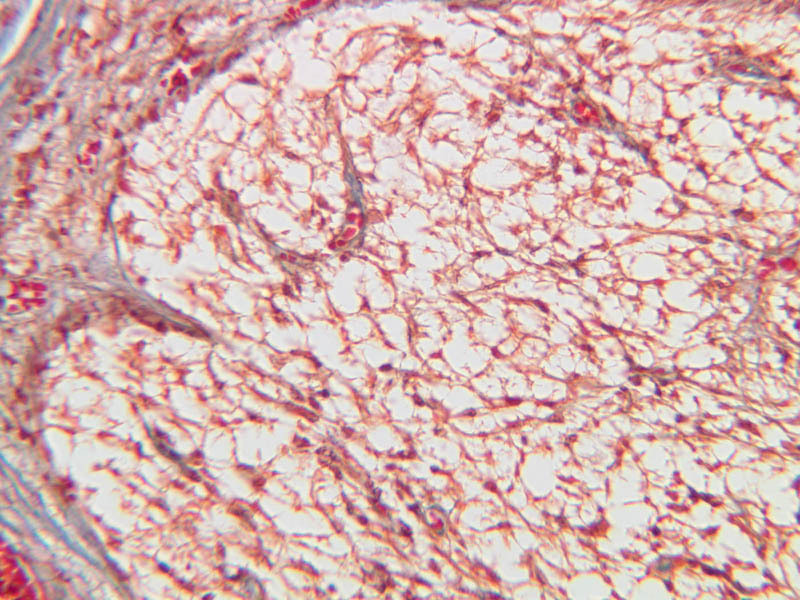 These cells tend to occur in small groups or clusters. 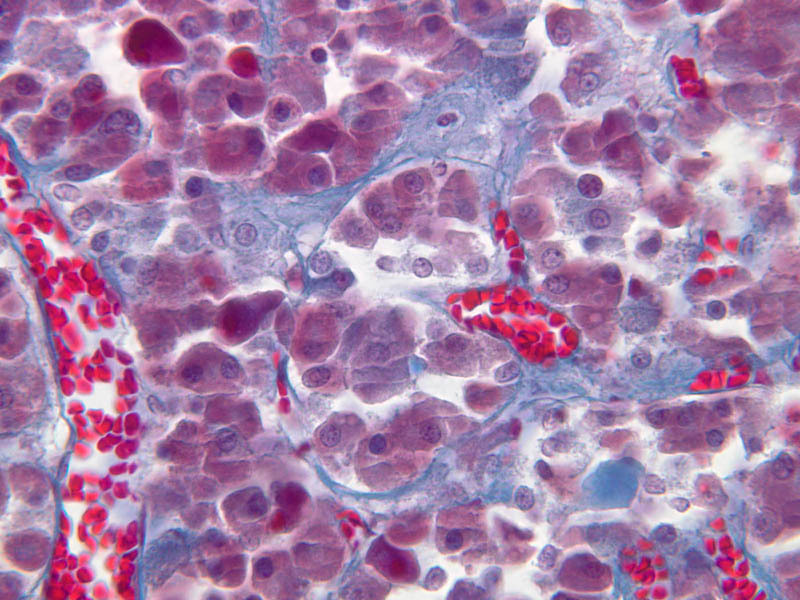 Basophils are responsible for the production of thyroid stimulating hormone (TSH), adrenocorticotrophic hormone (ACTH), and the gonadotrophic hormones follicle stimulating hormone (FSH) and luteinizing hormone (LH ); (3) chromophobes or C cells are smaller cells and have only a small amount of poorly staining cytoplasm (B-63, H&E [2.5x-labeled, 10x, 20x, 40x-labeled] [2.5x, 10x, 20x, 40x-labeled]; B-65, trichrome [2.5x, 10x, 20x, 40x-labeled] [2.5x, 10x, 20x, 40x] [10x, 20x, 40x-labeled] [2.5x, 10x, 20x, 40x] [2.5x, 10x, 20x, 40x]). What is the target organ of each of the hormones produced by the adenohypophysis? Note the rich vascularity of the adenohypophysis. Can you describe the blood supply and its significance? 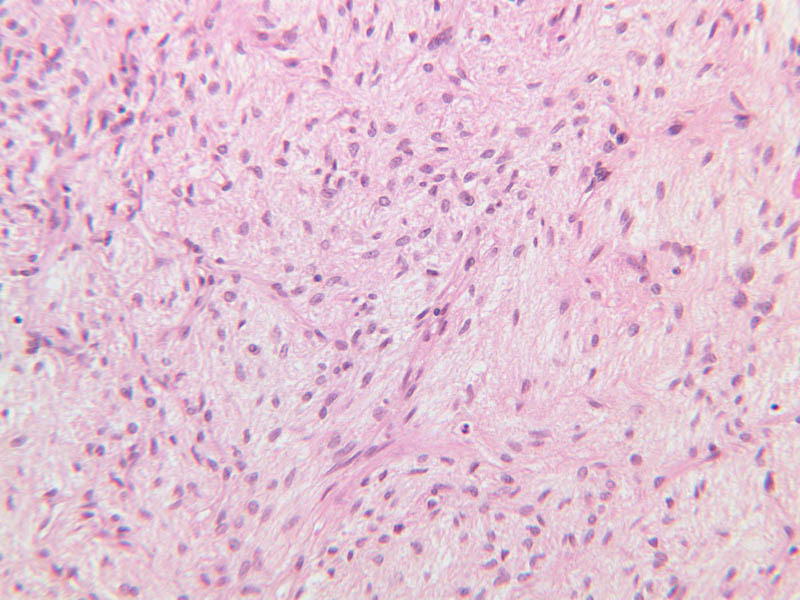 The neurohypophysis (posterior pituitary) (light pink in slide B-63, H&E [2.5x, 10x, 20x, 40x]; B-65, trichrome [2.5x-labeled, 10x, 20x, 40x] [2.5x-labeled, 10x, 20x, 40x]) consists in large part of the axons and axon terminals of neurosecretory cells whose cell bodies are located in the supraoptic and paraventricular nuclei of the hypothalamus. 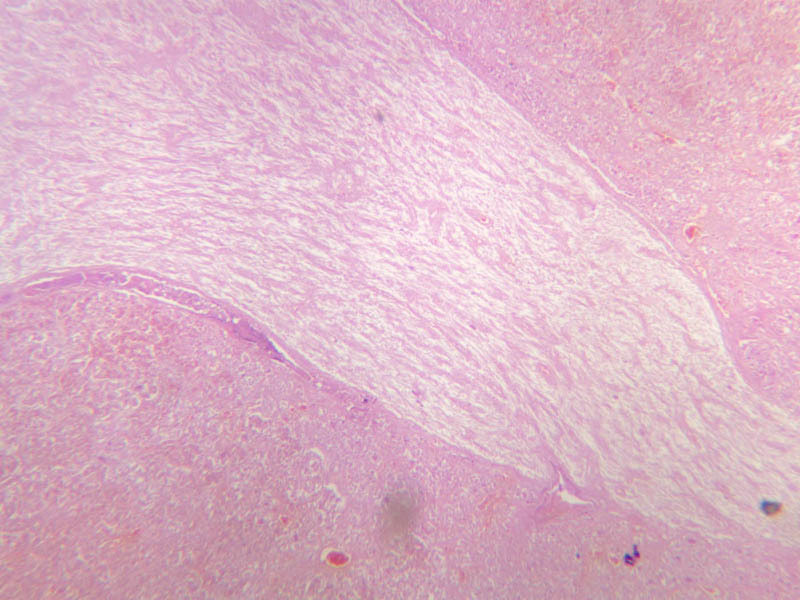 The unmyelinated axons of these cells pass through the infundibulum and end in relation to the numerous blood vessels of the pars nervosa. 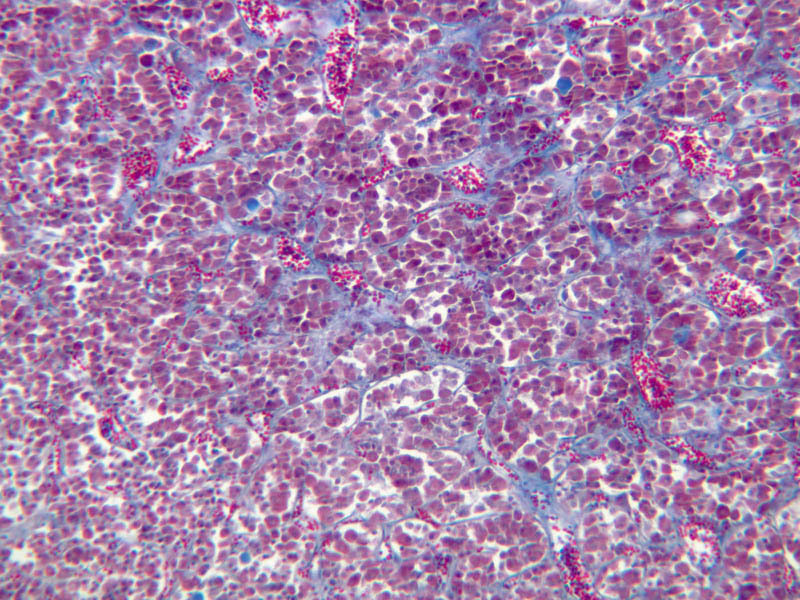 Dark purple granules of variable shapes and sizes are evident in the pars nervosa on slide B-64, stained with aldehyde fuscin ([2.5x, 10x, 20x, 40x-labeled] [2.5x, 10x, 20x-labeled, 40x]). 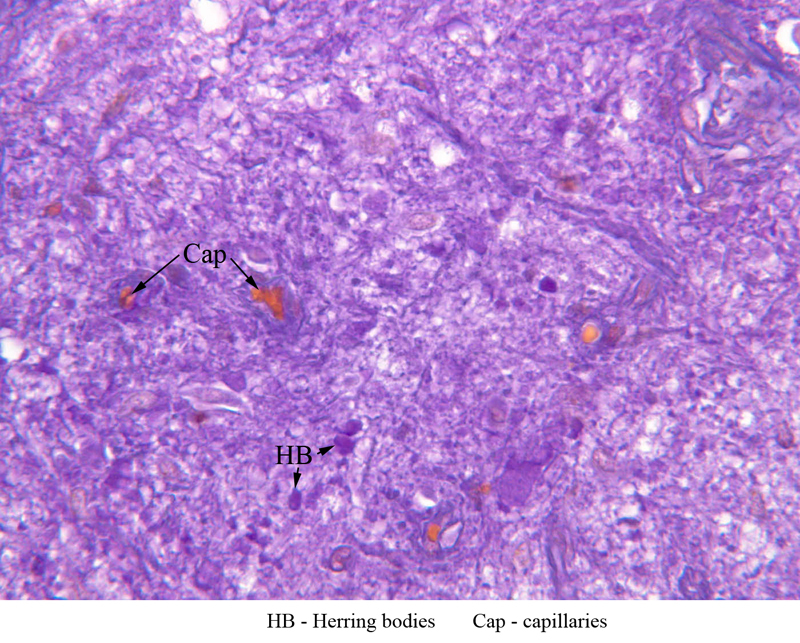 These structures, which are known as Herring bodies, represent accumulations of neurosecretory material in transit from the hypothalamus to release sites in the posterior pituitary. Two neurosecretory products are associated with the posterior pituitary: oxytocin (milk letdown factor) and antidiuretic hormone (ADH or AVP, originally called vasopressin). What are the target organs of the neurohypophyseal hormones? 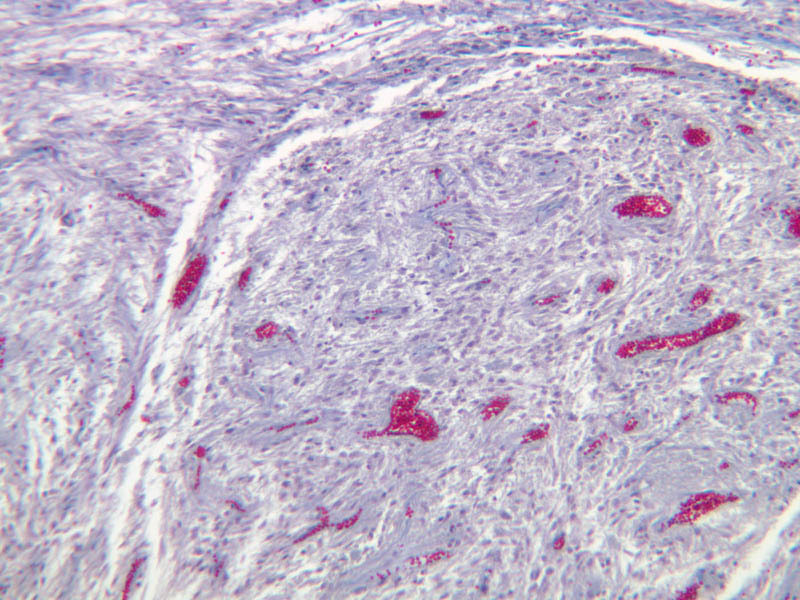 In addition to the axons of neurosecretory cells, the posterior pituitary contains fibroblasts, mast cells and glial cells known as pituicytes. 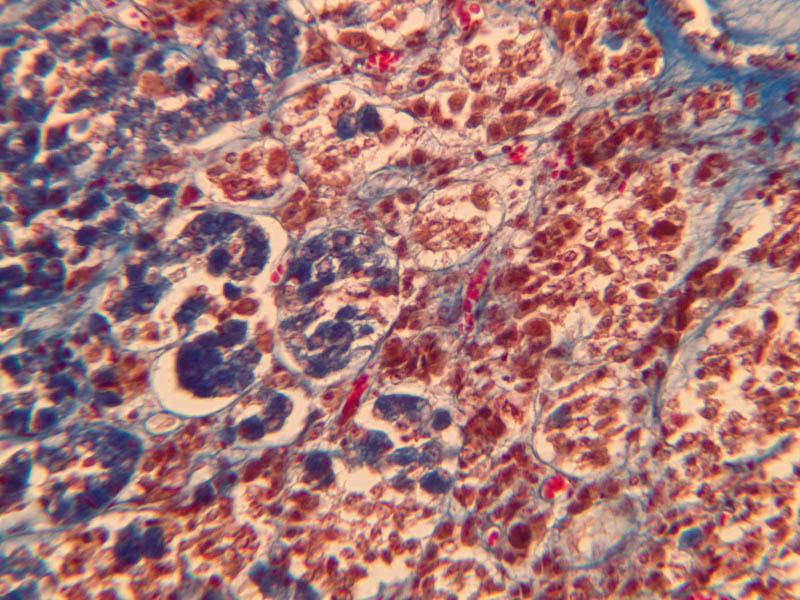 In the material available to you, little but the round to oval nuclei of these cell types will be evident. 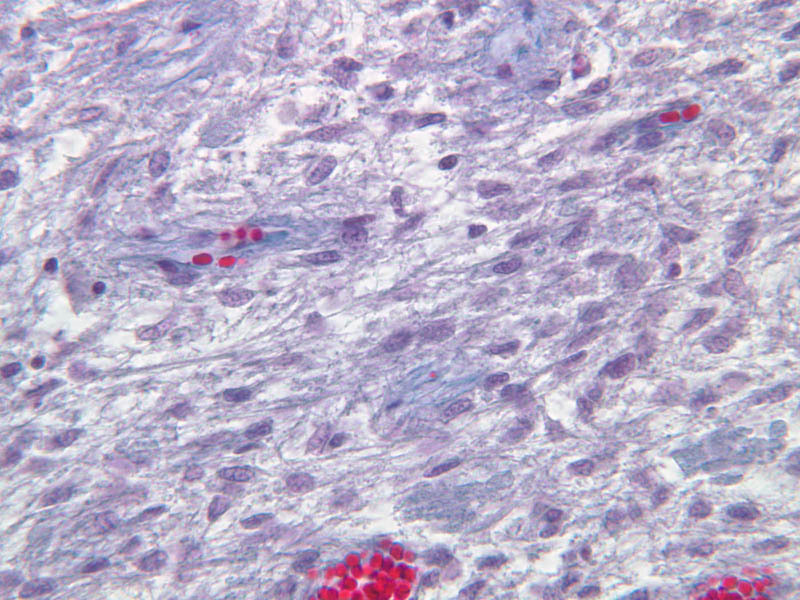 Since their cytoplasmic processes abut on capillaries, pituicytes appear to be equivalent to the astrocytes seen elsewhere in the CNS. 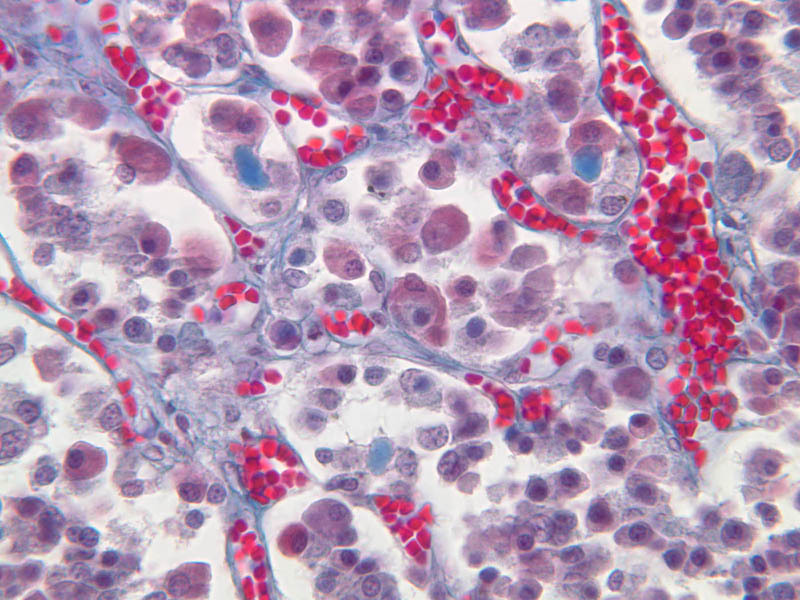 The thyroid gland (slide B-51, lead hematoxylin [10x, 20x, 40x, 40x]; B-52, H&E [10x-labeled, 20x, 40x-labeled, 40x]; B-53, PAS [2.5x, 10x, 20x, 40x]) consists of many closely packed, roughly spherical structures known as follicles, which are enclosed in a thick connective tissue capsule. 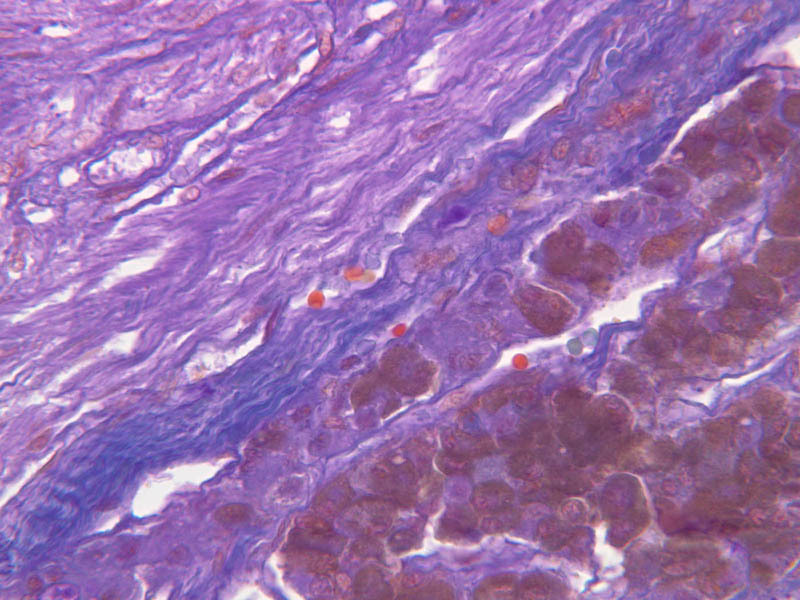 Connective tissue septa extend from the capsule into the substance of the gland, carrying numerous blood vessels. 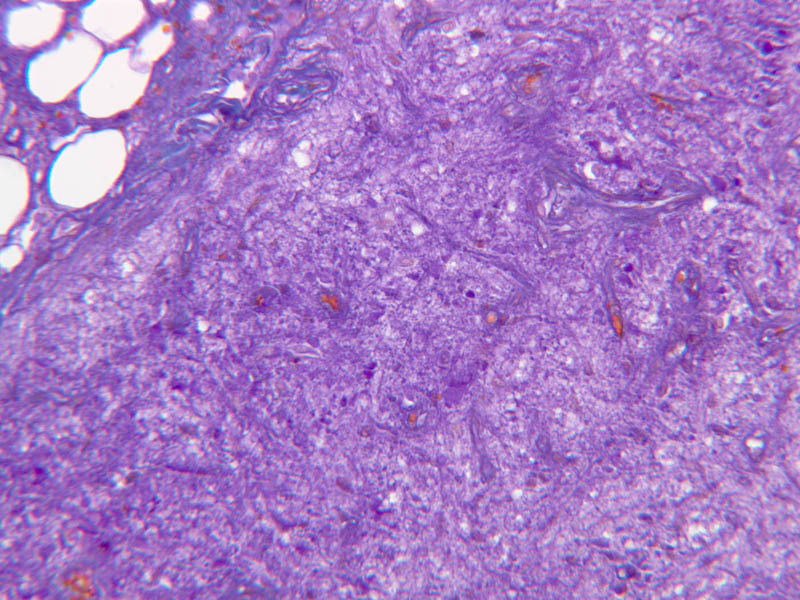 Follicular cells are arranged as shells of simple cuboidal epithelium surrounding a gelatinous mass known as colloid. 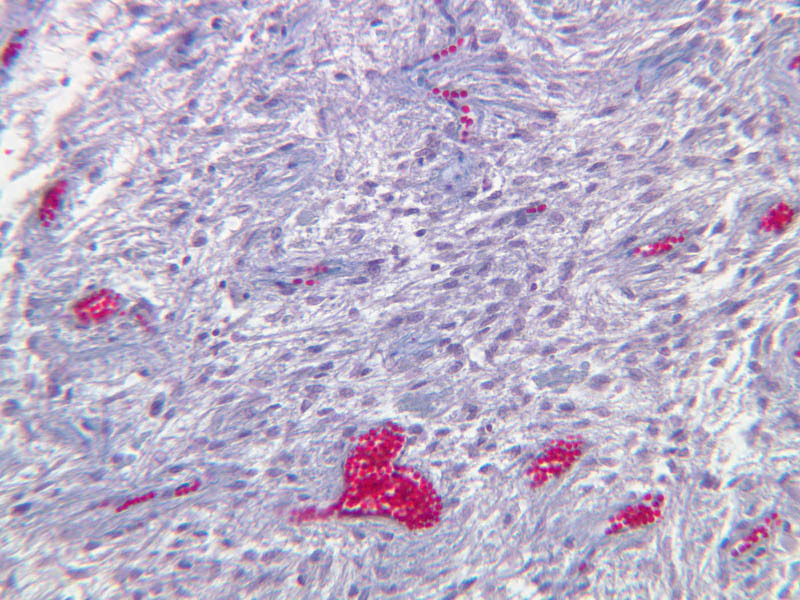 Look for a ring of epithelial cells around the homogeneous, pink-staining colloid. 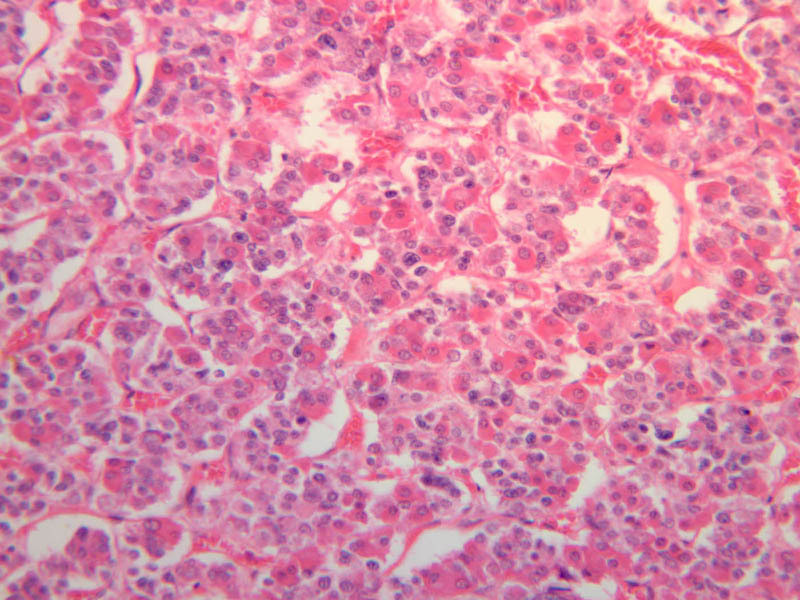 The cytoplasm of the follicular cells (principal cells) is faintly basophilic. 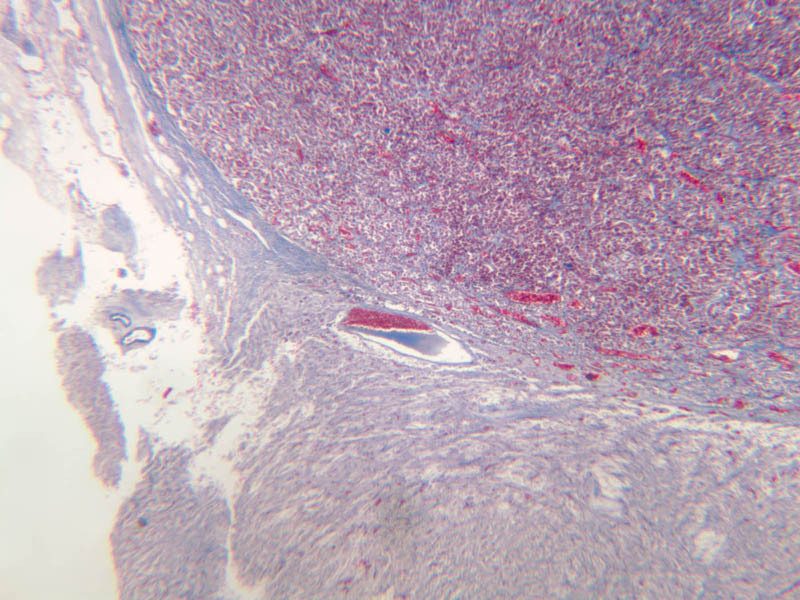 The follicular cells secrete thyroglobulin, a glycoprotein, which is stored extracellularly in the colloid. In response to TSH, the follicular cells endocytose the colloid and hydrolyze it to form thyroxine. You can see where colloid has been resorbed because this process leaves small holes in the colloid adjacent to the follicular cells. 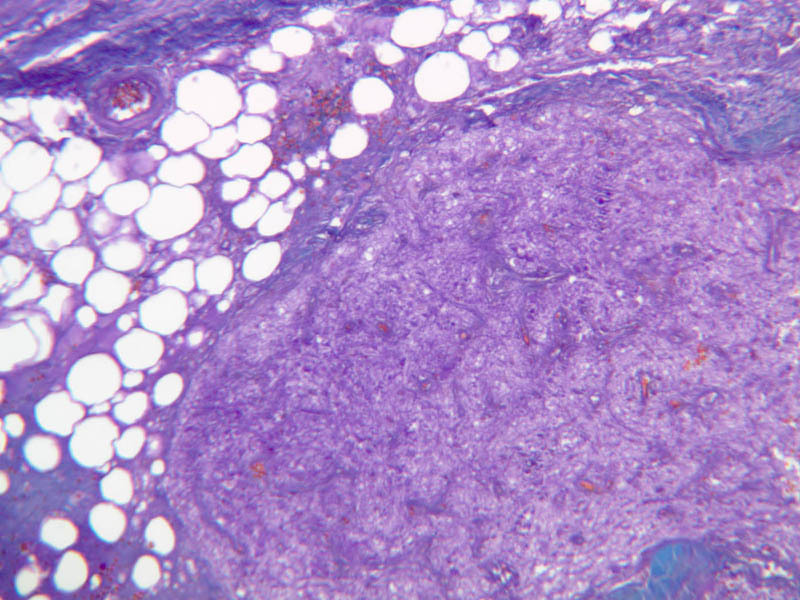 These holes are known as resorption lacunae (B-52 [10x, 20x, 40xlabeled]). 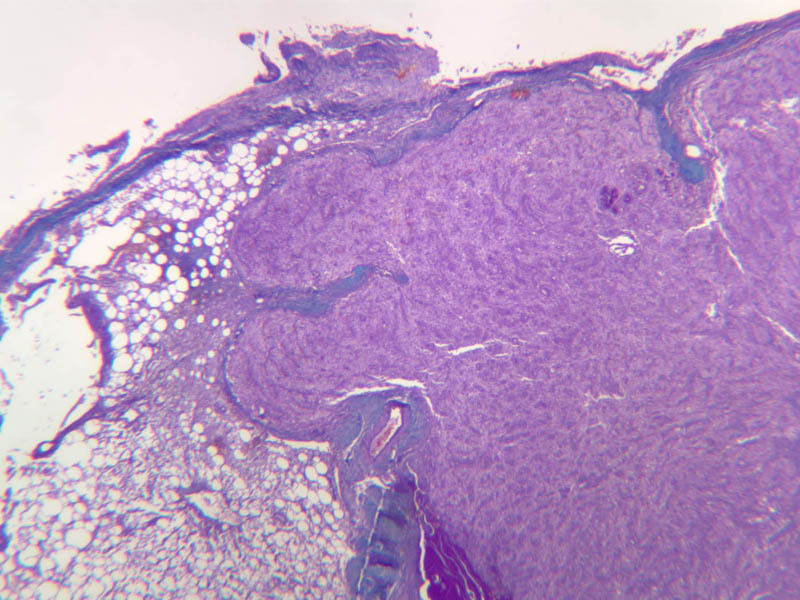 Very active follicles may exhibit a columnar epithelium and increased numbers of resorption lacunae. 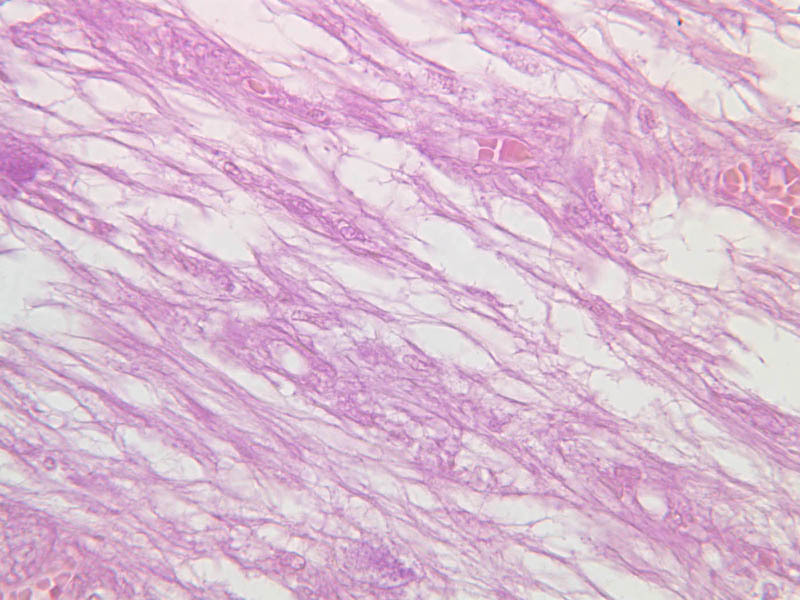 Between follicles, the stroma of the thyroid gland consists of a thin layer of connective tissue and a rich capillary network. 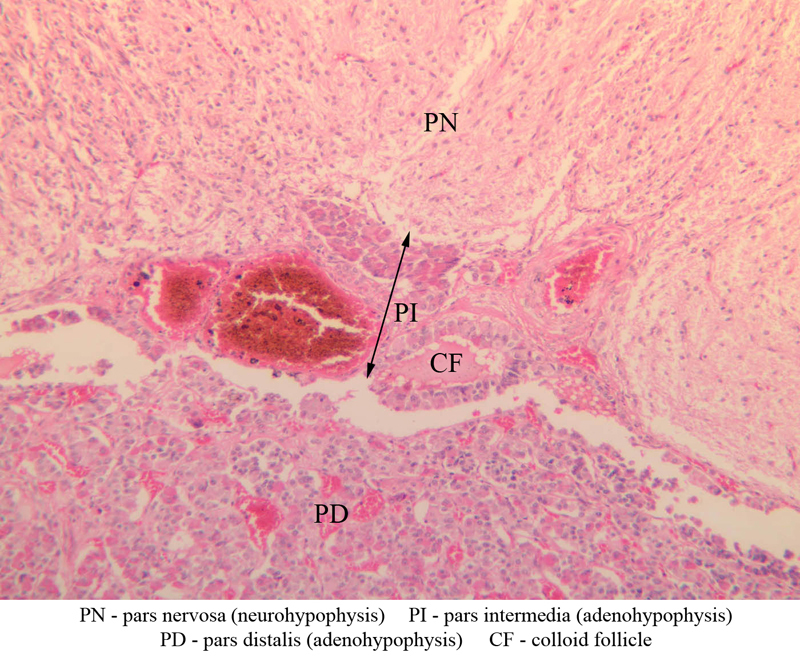 Parafollicular cells (light cells or C cells) are located in the connective tissue between follicles or adjacent to follicular cells within follicles. 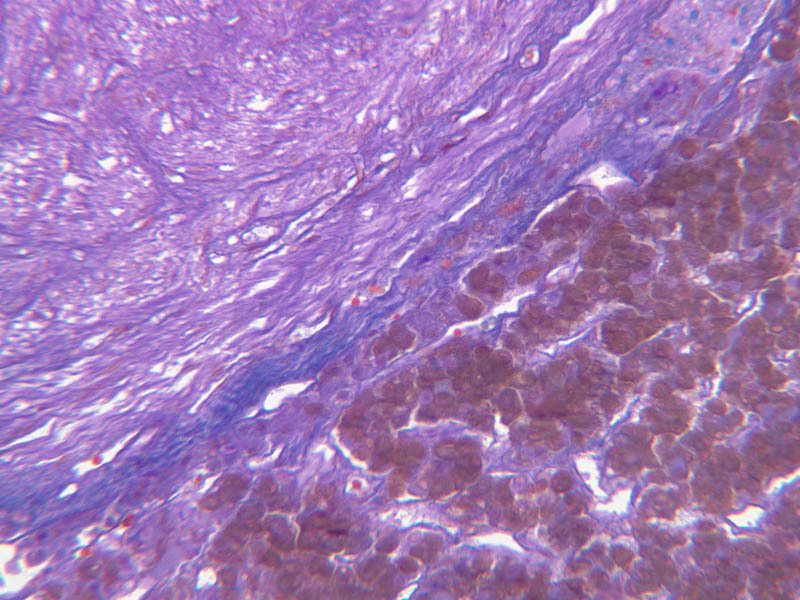 When they lie within the follicular wall, the parafollicular cells do not reach the lumen. 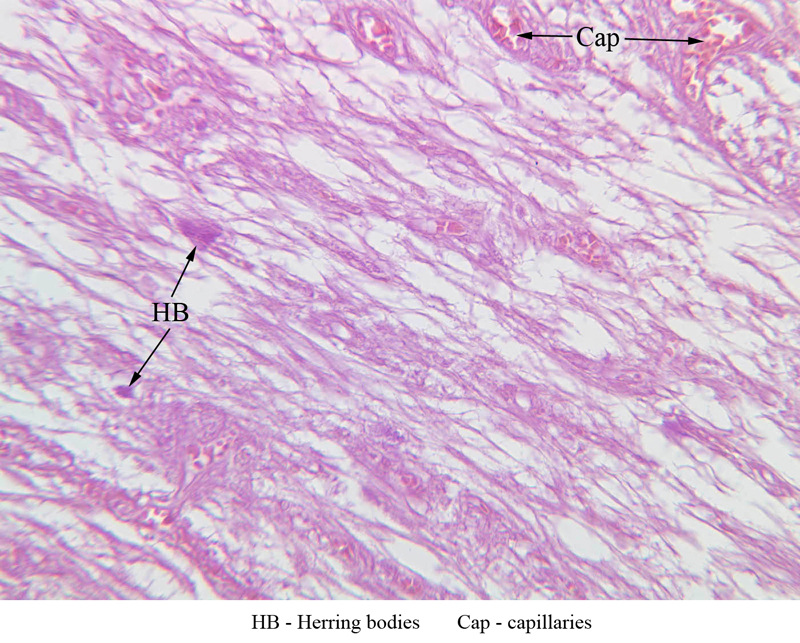 Parafollicular cells are slightly larger than the follicular cells and, in H & E preparations, have a more lightly stained cytoplasm (B-52, H&E [10x, 20x, 40x-labeled] [10x-labeled, 20x, 40x-labeled] [10x, 20x, 40x] [10x, 20x, 40x]; B-53, PAS [10x, 20x, 40x]). 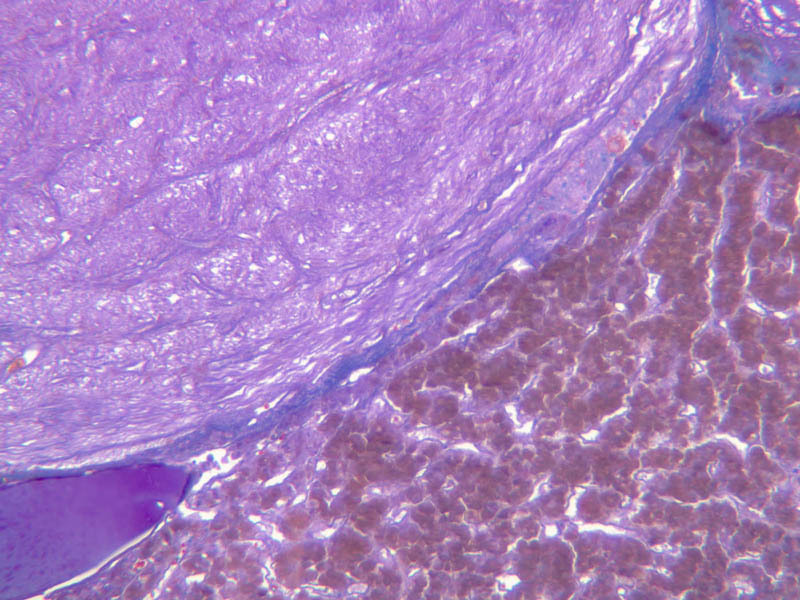 Parafollicular cells are readily identifiable in slide B-51 (stained with lead hematoxylin), where they appear as purplish-black structures in which the nuclei are difficult to discern (B-51 [10x, 20x, 40x-labeled]). These cells secrete calcitonin, which lowers serum calcium levels by inhibiting bone resorption and accelerating osteoid calcification. 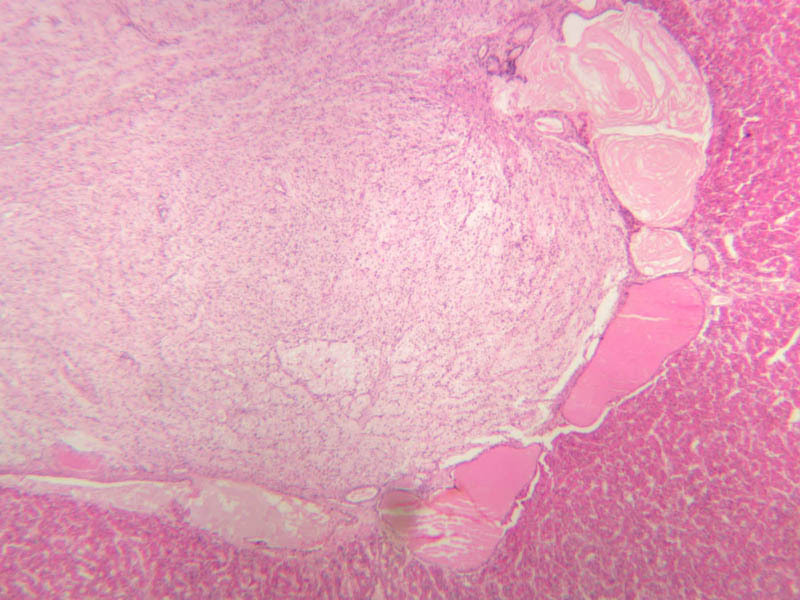 As a rule, four parathyroid glands, each approximately the size of an apple seed, are embedded in the connective tissue on the posterior surface of the thyroid. The polypeptide hormone produced by these glands, known as parathormone, serves to increase serum calcium and to decrease serum phosphate. Surgical removal or atrophy of these glands results in a drop of blood calcium level, muscular spasms and, ultimately, in cardiac arrest. Examine slide B-56 (H&E [2.5x, 10x, 20x, 40x-labeled] [10x, 20x, 40x-labeled] [20x, 40x] [10x, 20x, 40x-labeled] [10x, 20x, 40x]). 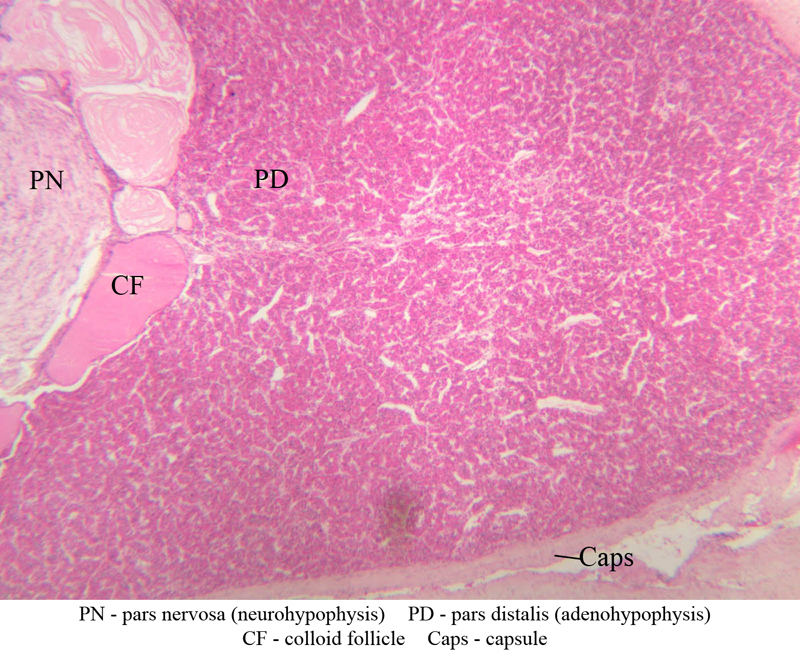 The connective tissue capsule of each parathyroid gland is continuous with that of the thyroid gland. It extends into the substance of the gland, dividing it into poorly defined lobules. 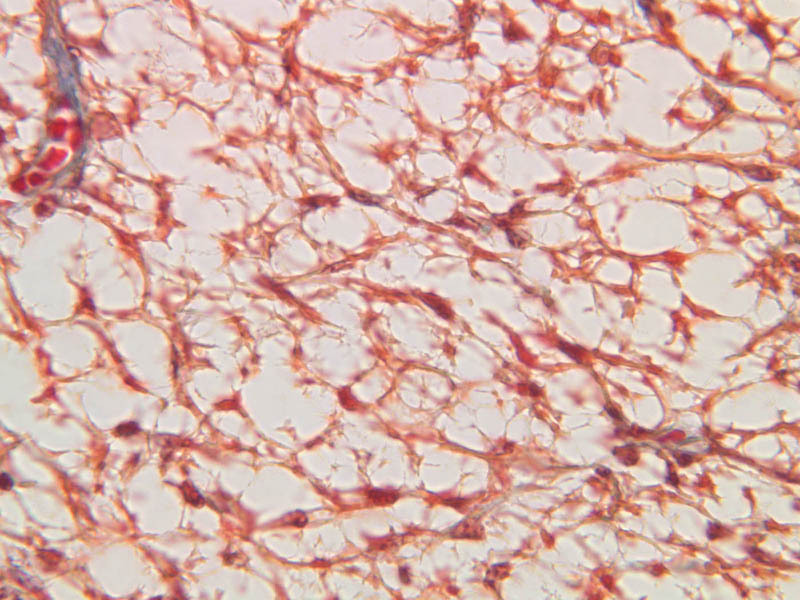 Fat cells may separate the groups of cells and increase with age. Note the rich capillary network. 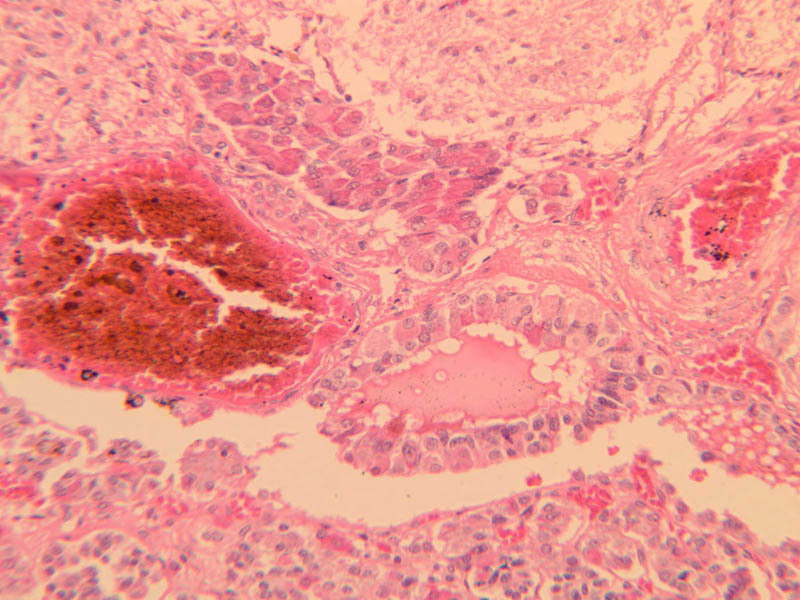 The parenchyma is composed of two types of cells: (1) Principal or chief cells and (2) oxyphil cells. 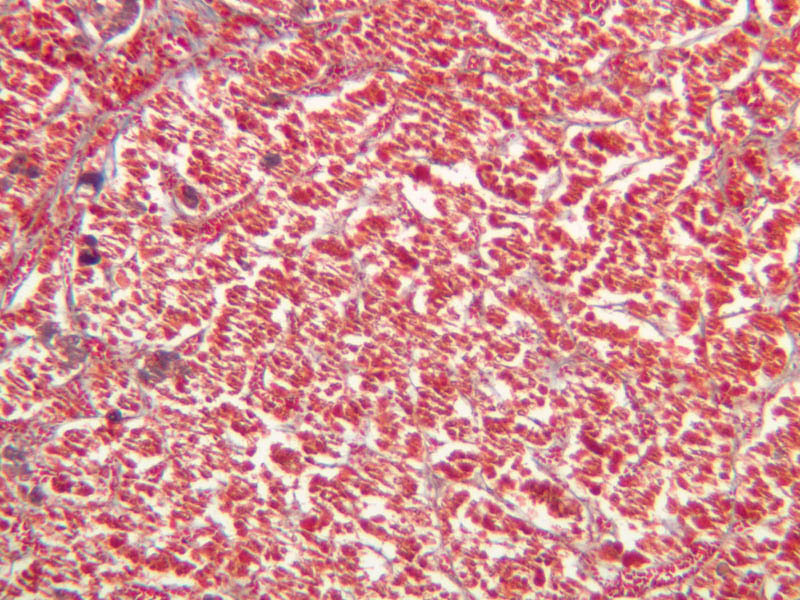 The polygonal chief cell is by far the more numerous cell type. Its nucleus is centrally located and has a vesicular chromatin pattern with a prominent nucleolus and its cytoplasm stains rather lightly. Oxyphil cells, which are less regular in shape and considerably larger than chief cells, are scattered singly or in small clusters. Their nuclei are smaller and more condensed than those of the chief cells and, owing to a very rich complement of mitochondria, their cytoplasm is distinctly acidophilic. 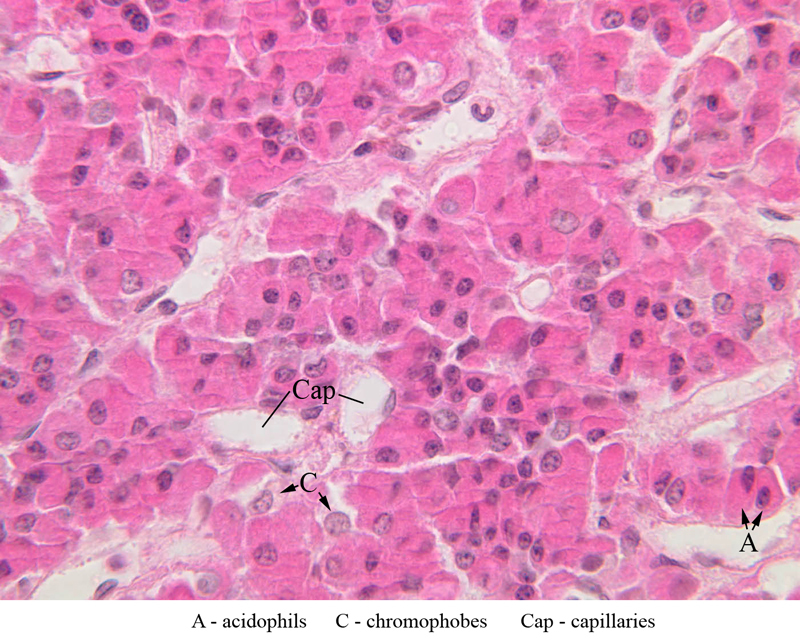 The adrenal gland (slide B-59, H&E [2.5x-labeled, 10x-labeled, 20x, 40x-labeled] [2.5x, 10x-labeled, 20x, 40x]; B-60, H&E [2.5x-labeled, 10x, 20x, 40x]; B-62, H&E [10x, 20x, 40x] [2.5x, 10x]) is a composite organ consisting of two functionally, structurally and embryologically different parts—an outer cortex and an inner medulla. Observe the gland at low power. Find the loosely organized tissue that comprises the medulla and the partially-separated columns of cells that make up the cortex. 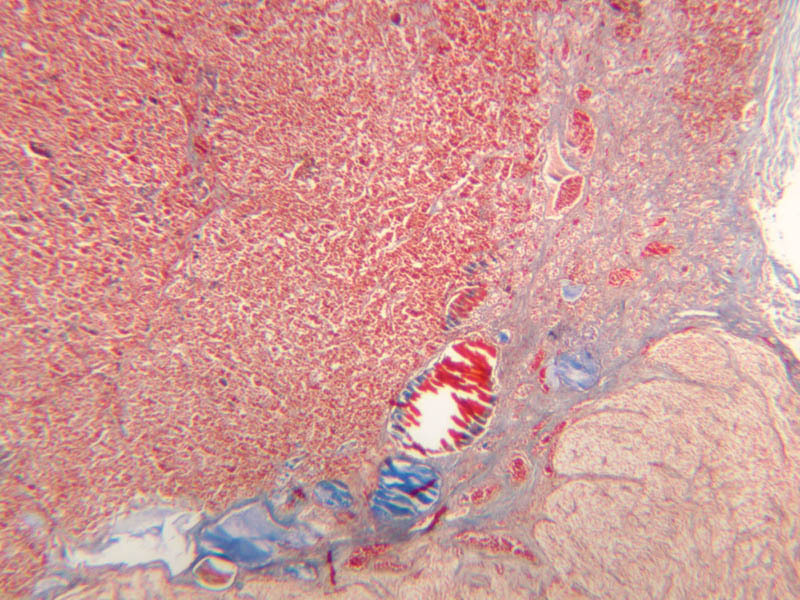 Scan the capsule and the tissue around it, looking for nerves and blood vessels. Study the pattern of cortical vasculature. In a pattern similar to that seen in the pars distalis of the pituitary, sinusoids run along the edges of columns or cords of cells. 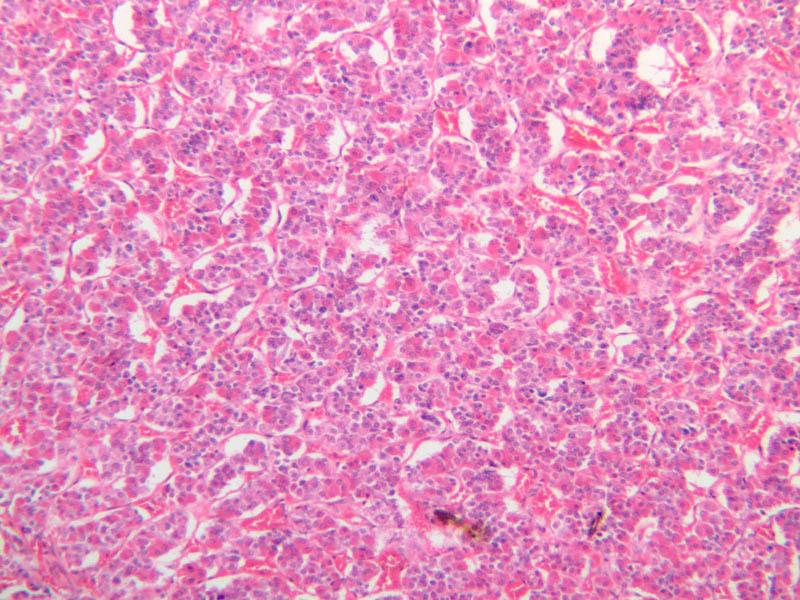 Owing to different arrangements of its constituent cells, the adrenal cortex has a layered appearance. 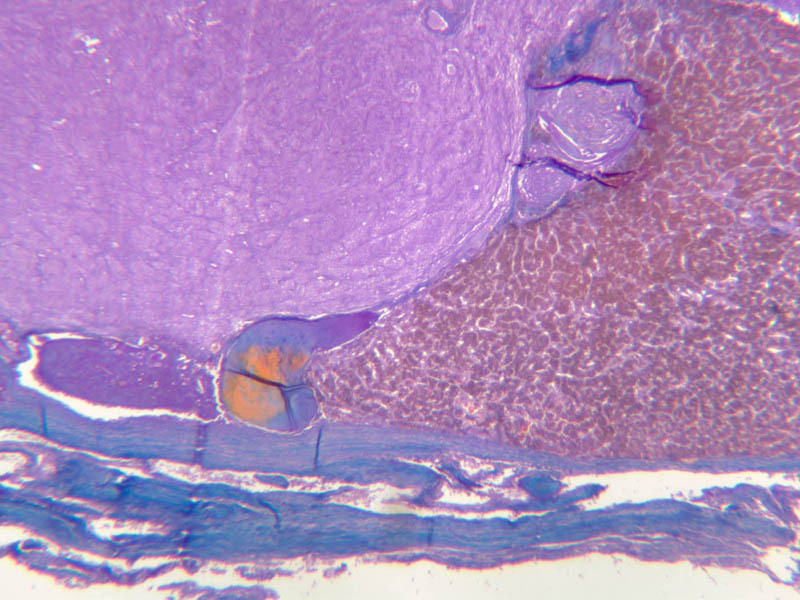 From the capsule inward, these cortical layers are known as the zona glomerulosa, the zona fasciculata, and the zona reticularis. 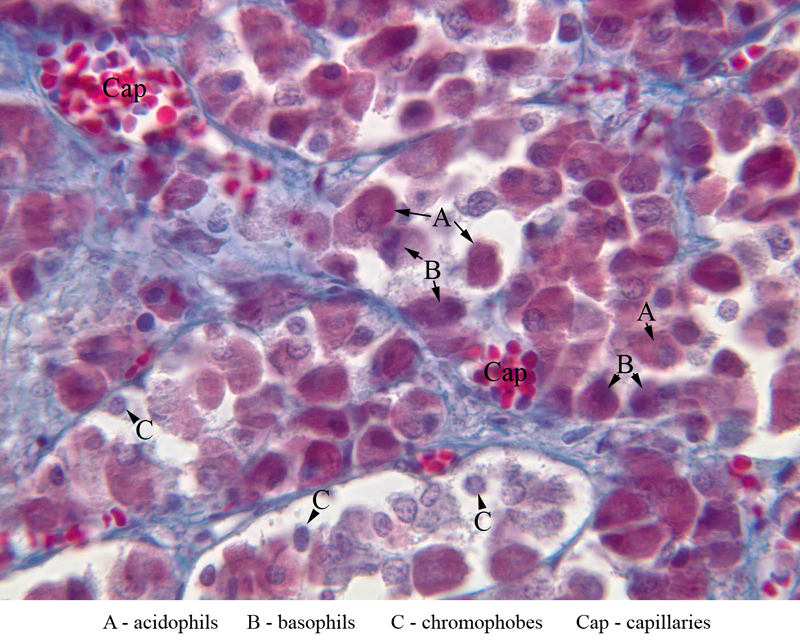 The zona glomerulosa is located immediately beneath the capsule (B-60 adrenal gland, dog [10x, 20x] [20x, 40x]; B-59 [2.5x, 10x, 20x] [2.5x, 10x, 20x]). Its constituent cells are arranged in arcs or spheres, and, owing to their relatively small size, their nuclei appear to be close together. 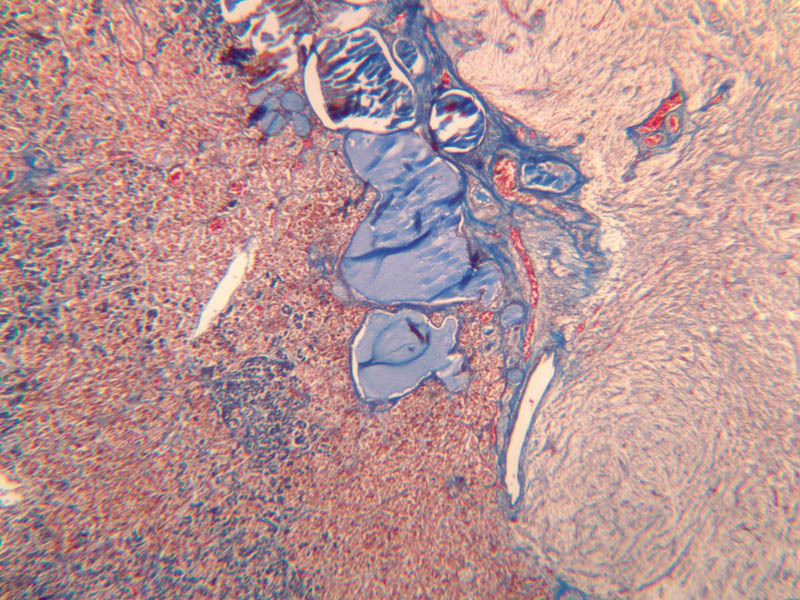 Cells of the zona glomerulosa secrete mineralocorticoids (e.g., aldosterone). The zona fasciculata consists of parallel columns or cords of cells that radiate toward the medulla and are separated by blood sinusoids (B-60 [2.5x, 10x, 20x, 40x]; B-62 [20x, 40x]). 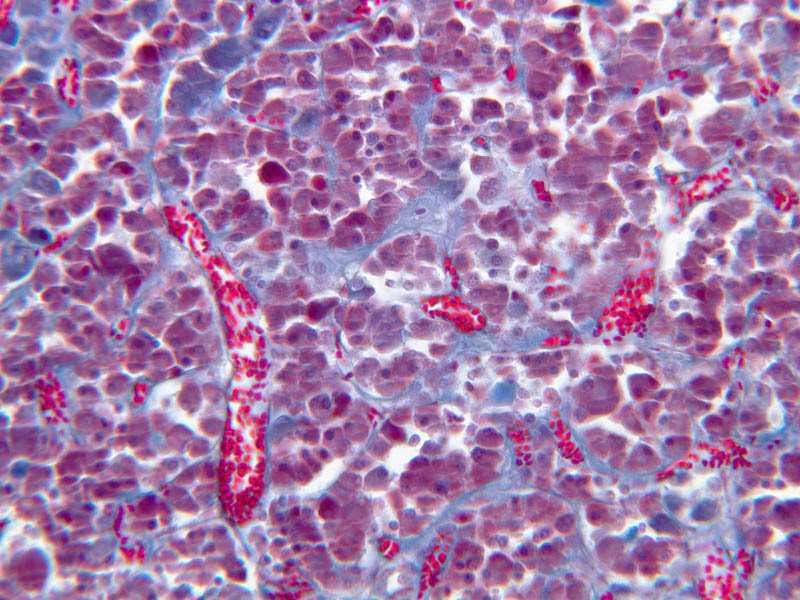 Owing to the extraction of lipids during histological processing, the cytoplasm of cells in the zona fasciculata appears highly vacuolated or "foamy". Cells of the zona fasciculata secrete glucocorticoids (e.g., hydrocortisone & cortisone) and some gonadocorticoids (weak androgens). 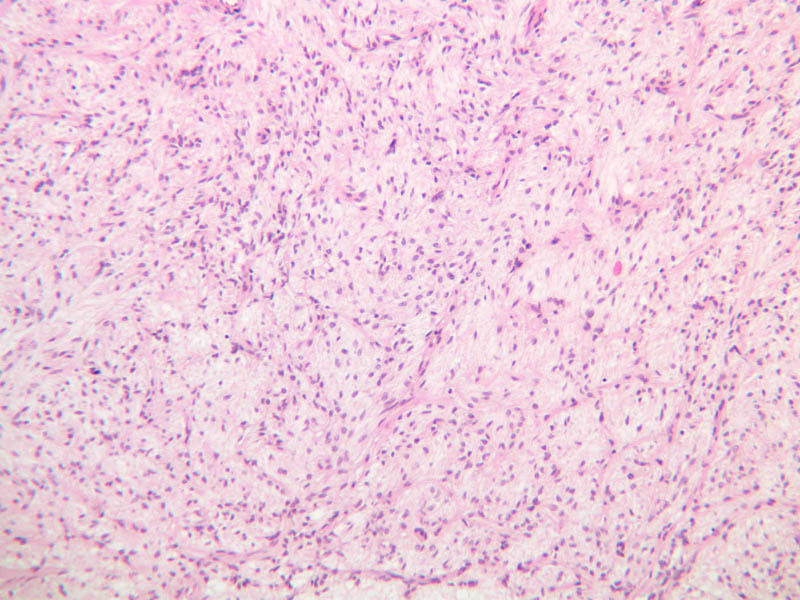 The zona reticularis is the deepest cortical layer and lies adjacent to the medulla (B-60 [20x, 40x]; B-62 [20x, 40x]). It is characterized by irregular, interconnecting cords of cells which are separated by anastomosing capillary networks or sinusoids. 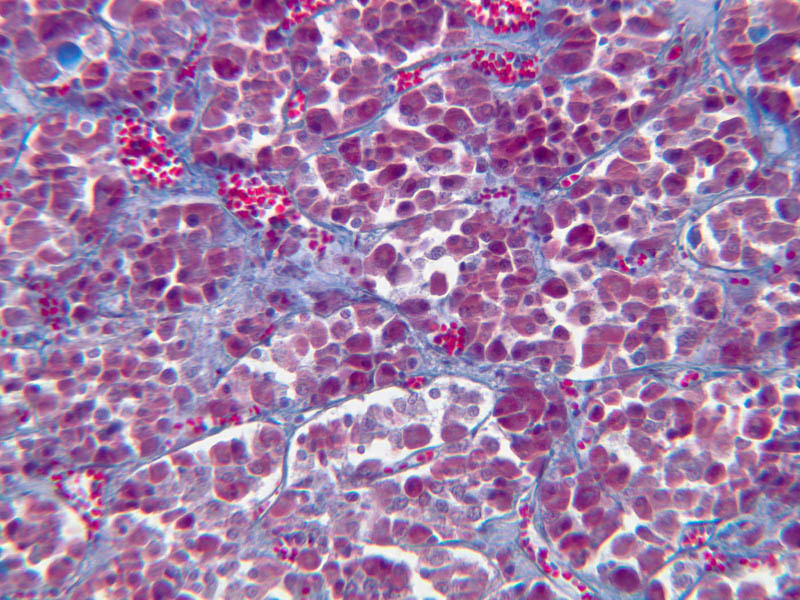 Cells of the zona reticularis, which are smaller than those of zona fasciculata and do not contain as many lipid vacuoles, secrete gonadocorticoids and some glucocorticoids. 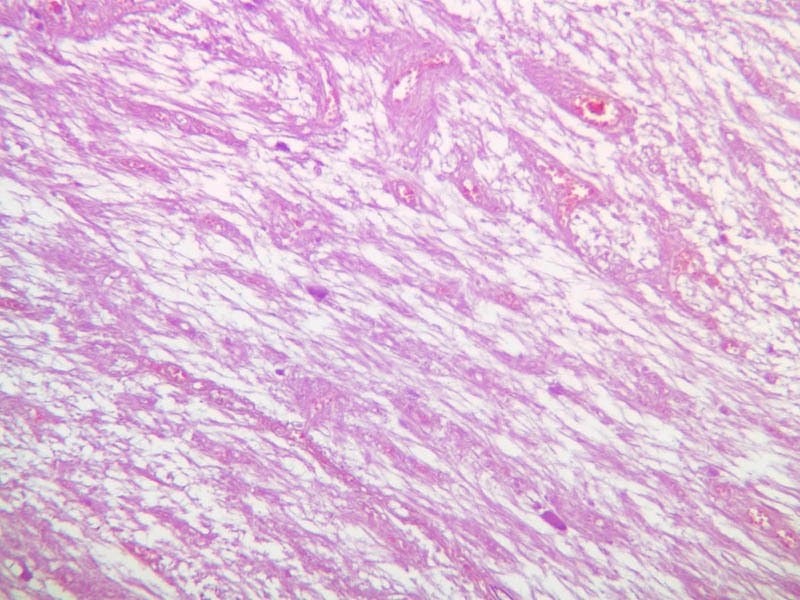 The medulla is composed of large epithelioid cells, arranged in small groups or cords which are separated by blood vessels. 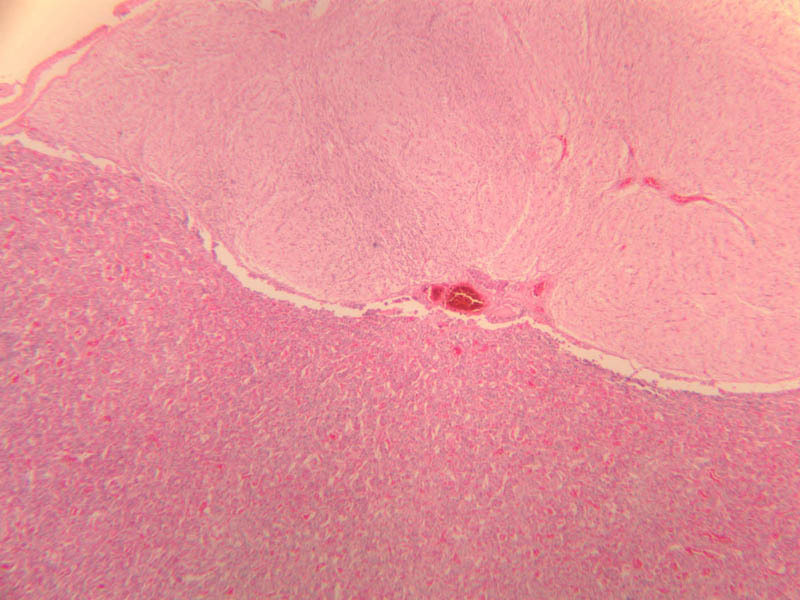 Usually, several large veins mark the center of the medulla. 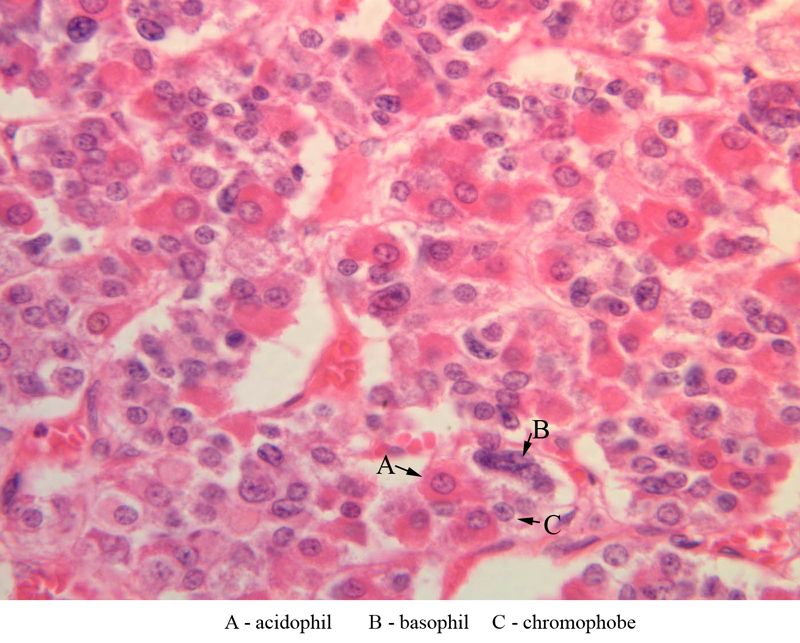 When fresh adrenal gland is incubated in solutions of chromium salts (as was the specimen on slide B-61), brownish precipitates form in the cells of the medulla-- hence, the name chromaffin cell (B-61, chromaffin [2.5x, 10x, 20x, 40x] [2.5x, 10x, 20x, 40x-labeled]). 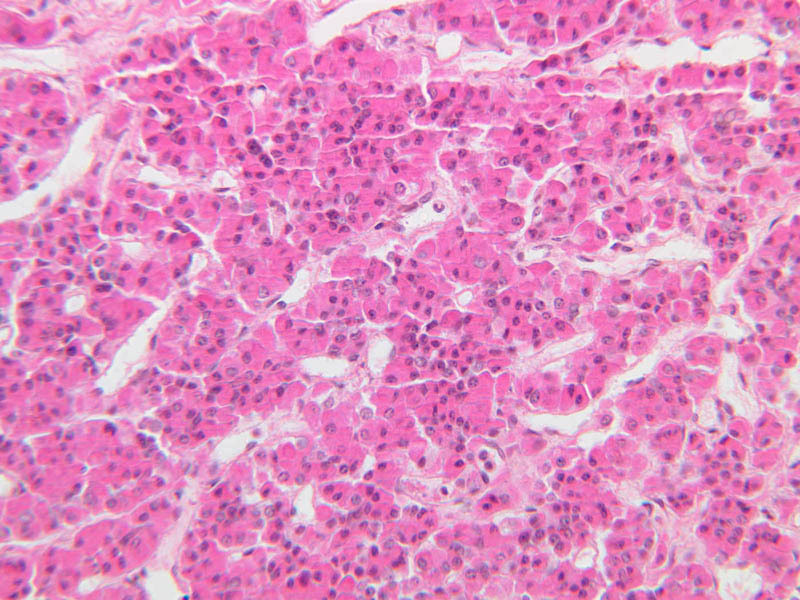 The more darkly stained chromaffin cells are known to contain norepinephrine, the less darkly stained cells, epinephrine. 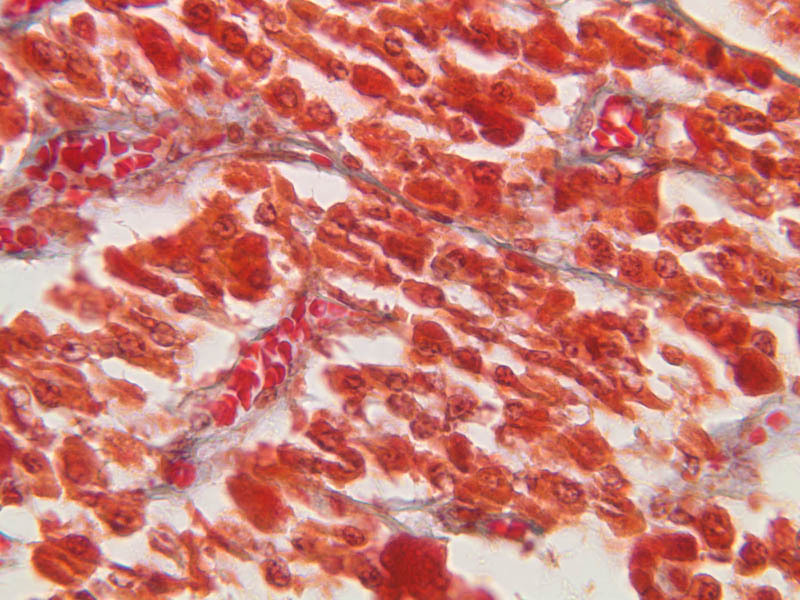 In essence, chromaffin cells are specialized postganglionic sympathetic neurons. 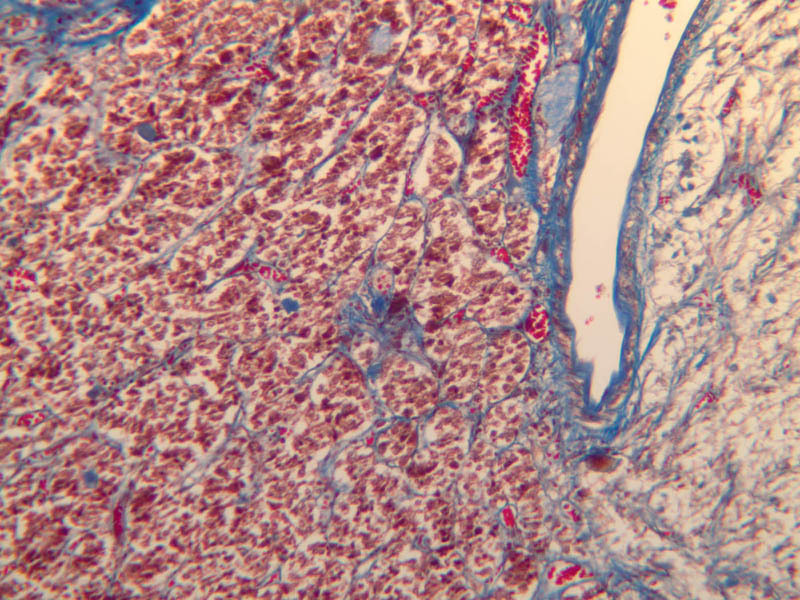 How does the ultrastructure of these cells differ from that of the secretory cells of the adrenal cortex? 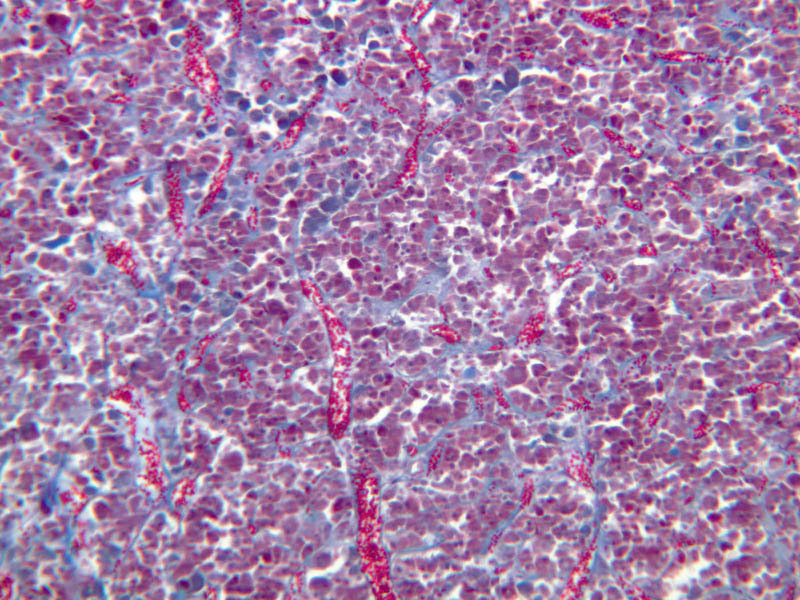 In addition to the chromaffin cells, the adrenal medulla contains occasional postganglionic parasympathetic neurons which innervate the adrenal vasculature. 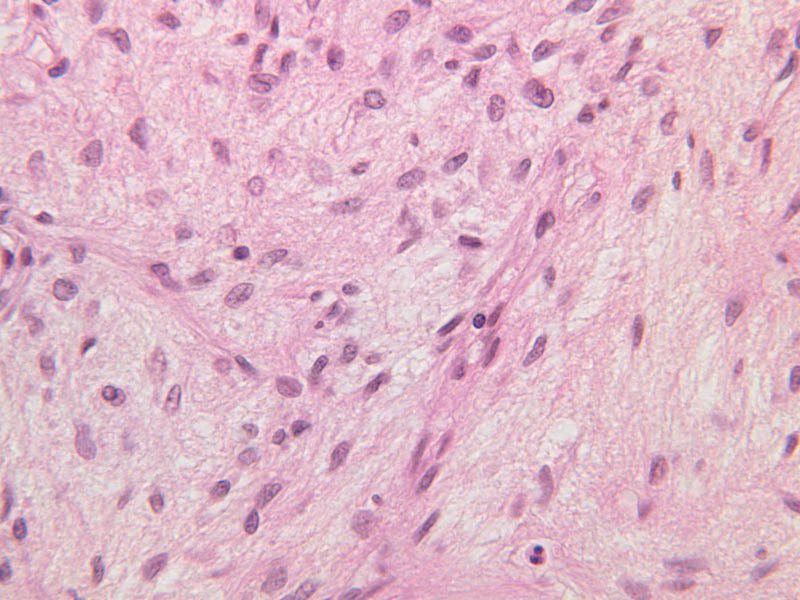 These nerve cells occur singly or in clusters and are characterized by large, somewhat eccentric nuclei with a single prominent nucleolus.